We’ve spent the last several weeks describing capabilities of leading big data analytics software. But now, we get down to examples of enterprises extracting value from otherwise dormant data. San Francisco-based Wells Fargo & Company has provided financial services to customers for 163 years. But like all modern companies, they must cope with changes that big data has created. Members of the IT staff quickly realized that gathering a lot of data was easy. Helping people make solid decisions based on data was hard. That’s because in 2014, Wells Fargo customer data was generated from 70 million customers served at 8,700 locations from offices in 36 countries. Collect and integrate massive data to identify user stories and their behavior. Integrate data from different sources and process it quickly. Create a development team quickly, build a development infrastructure and create value immediately with few resources. Capabilities § Tableau automation accelerated processing and reduced the resources usually engaged in preparing data for reports. § LoadableTableau connectors enable business users to handle data from many sources and convert it to engaging, easy-to-use graphics and dashboards. Benefits/Value § Make make more sense of data -> insights, especially outliers.§ Spend more time identifying customer segments and new services they might want. § Understand customer demographics and behavior -> make accurate, data-driven decisions. 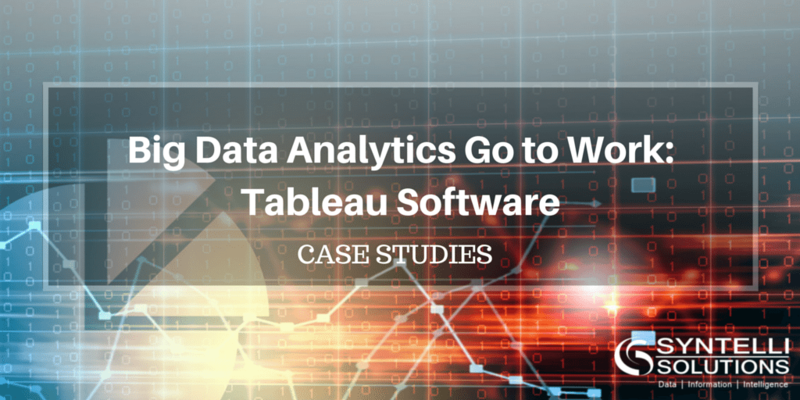 With Tableau, the development team designed services that reached a broad audience. They designed the portal with a lot of information, which in the past, would have required a much larger team. With the Tableau-based visualization solution, the team could focus their resources on delivering hefty returns on investment. Visa Europe enables members in 36 European countries to make electronic payments between millions of consumers, retailers and businesses, and government agencies. Most of the data that Visa Europe uses is highly structured payments information. They’ve invested a lot of time in organizing and structuring data and placing it in a warehouse. Their challenge was gathering and preparing data and using big data analytics to create a story that appeals to internal stakeholders and customers. But results took far too long. Projects and engagements were too slow, and the quality of deliverables was sub-par. With company support, the team tried a three-month Tableau Server pilot. The challenge: prove that Tableau could help Visa Europe quickly extract value from massive data stores. Assignment Accelerate insight and help decision-makers understand the value previously hidden in their data. Benefits/Value § Much faster speed to understanding§ Faster time to market for new products and internal reports. § Flexible, attractive graphics and dashboards make it easier to concentrate on what’s important—insight rather than presentation. With a 12-week implementation, the team quickly delivered more effective and engaging results than were possible with earlier solutions. And when business users throughout the company got news of the initial results, they wanted a piece of the action, too. Syntelli is a Tableau partner and our data scientists are passionate about solving your organization’s problems! Contact us today or request a demo of Syntelli Services!